Your daily scoop of what State of the Union is watching today, August 13, 2014. 1. Iraq. As nearly 130 more American military advisers arrive in northern Iraq, the U.S. is considering an air evacuation of thousands of Yazidis stranded on a mountain and threatened by ISIS fighters. 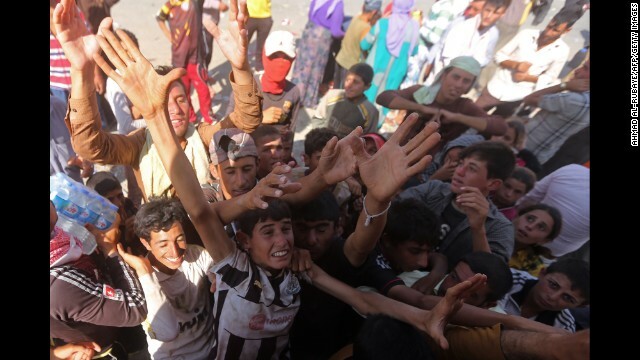 The plight of the Yazidis, coupled with the ISIS assault against Iraq's semiautonomous Kurdish region, prompted the United States to begin targeted airstrikes over the past several days. Humanitarian airdrops of food and water are also underway. A U.S. official tells CNN that if an air operation is proposed and approved by President Obama, it would require putting U.S. ground troops both on the mountain and at a nearby airfield. The official also said focusing on a possible air option - rather than a ground one - is due to initial indications that going by land would take too long would up the risk to the Yazidis. Meanwhile Iraq's Prime Minister Nuri al-Malaki is fighting efforts to replace him as his support crumbles. Iraq's president has nominated Haider al-Abadi to be the new prime minister, a move supported by both the U.S. and Iraq's neighbor Iran. 2. Ferguson, MO. The suburban St. Louis city remains tense four days after a police officer shot and killed unarmed teen Michael Brown. Authorities have yet to publicly identify the officer because of alleged death threats against him. Ferguson Mayor James Knowles says there are growing security concerns. "Hackers have tried to find personal information and display it online on social media, asking people to target myself, council members, the police chief," Knowles said in an interview with CNN "The county police chief's own home was put on Instagram, and people (were) asked to go there and assault him." Attorney Benjamin Crump, who is representing Brown's family said the decision not to release the officer's name "doesn't give the community confidence." Ferguson Police Chief Tom Jackson said the officer was taken to the hospital after the shooting and was treated for a swollen face. He also said the officer is shaken about the incident. 3. Obama and Clinton. The two are expected to party together on Martha's Vineyard tonight after the former Secretary of State trashed the President's "Don't do stupid stuff" foreign policy motto in a recent interview. "Great nations need organizing principles, and 'Don't do stupid stuff' is not an organizing principle," Clinton told The Atlantic Magazine. Clinton spokesman Nick Merrill said she later called Obama to "make sure he knows that nothing she said was an attempt to attack him, his policies, or his leadership." Deputy White House Press Secretary Eric Schultz said Obama appreciated Clinton's call and that they have a "close and resilient relationship."